Consultancy services for the master-planning, designing and supervision of construction of IT Park and Mini-Tech Estate at Abbottabad. 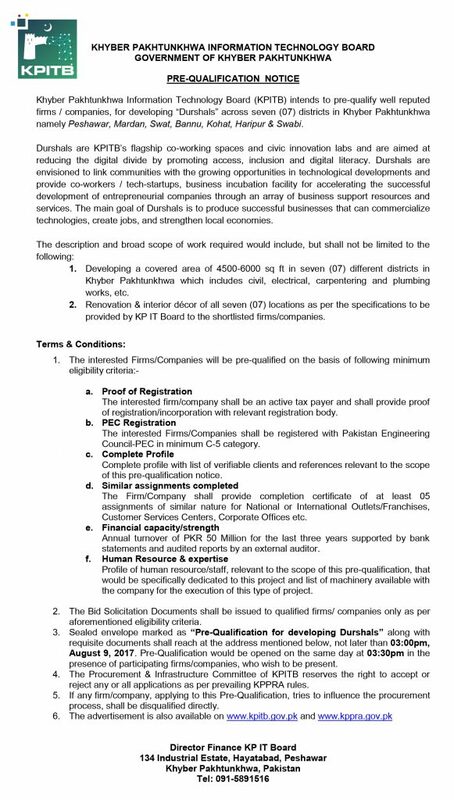 Feasibility Study of constructing IT Park at Abbottabad on public private partnership basis, under the Khyber Pakhtunkhwa Public Private Partnership Act, 2014. Khyber Pakhtunkhwa Information Technology Board (KPITB) invites “Expression of Interest (EOI)” from reputable and experienced Information and Communication Technology (ICT) companies/firms registered with the Pakistan Telecommunication Authority (PTA) for the provision of Managed Wi-Fi Services under its “Open Wi-Fi – Tech Cafes Project”. The Open Wi-Fi Solution is tailored to effectively address the growing internet demand of students for their online needs. The objective is to deploy a solution that makes high bandwidth Wi-Fi available in the high foot fall / common areas of public sector institutions. Planning, installation and commissioning of Managed Wi-Fi Solution across the selected Universities and Colleges of Khyber Pakhtunkhwa. 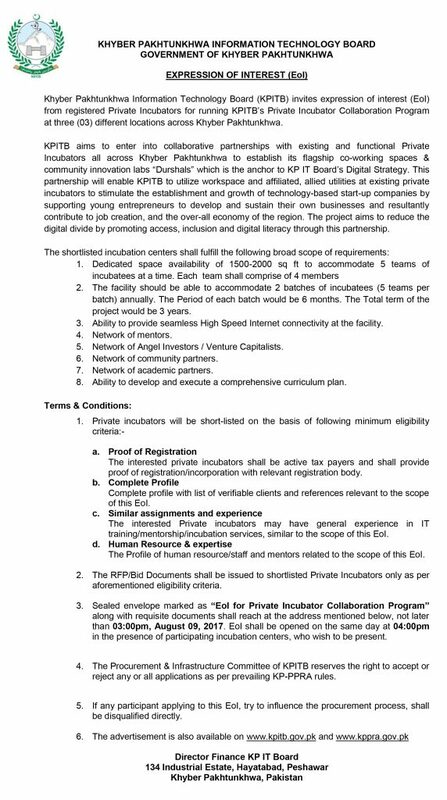 Khyber Pakhtunkhwa Information Technology Board (KPITB) invites expression of interest (EOI) from well reputed consultants, for conducting feasibility study for the establishment of Citizen Facilitation Centers (CFCs) in Peshawar, Khyber Pakhtunkhwa, Pakistan. Citizen Facilitation Center shall be a one-stop service center established to facilitate citizens to access public services. It shall primarily focus on providing consolidated access to various services such as provision of domicile certificates, permits, licenses, affidavits, tax payments, vehicle registration etc. KPITB intends to establish Citizen Facilitation Centers in a phase-wise manner, starting with establishing three (03) centers at various locations in Peshawar.